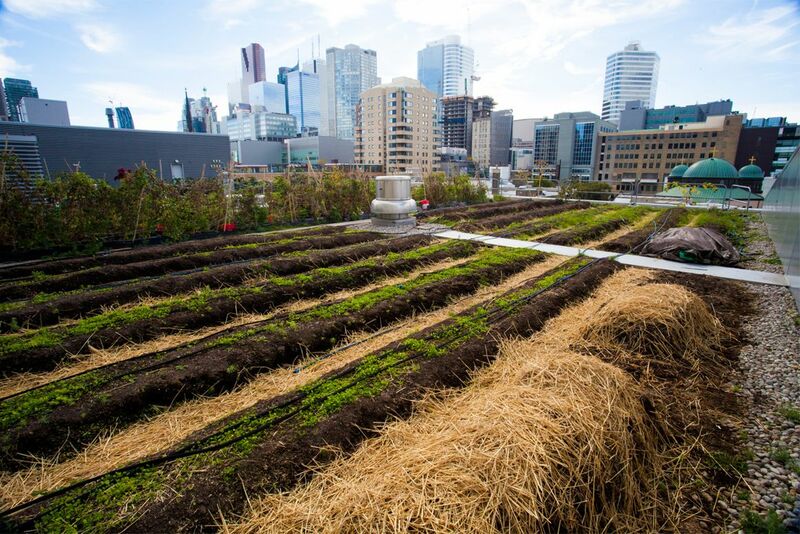 Ryerson Urban Farm is situated at Ryerson University on the Andrew and Valerie Pringle Environmental Green Roof, located on the George Vari Engineering and Computing Centre, 245 Church Street, Toronto, ON, Canada M5B 2K3; visit their website. 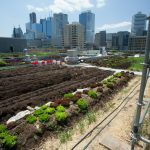 Watch the 2:46 Ryerson Urban Farm – Project of the Week 5/30/16 video from Greenroofs.com on the greenroofsTV channel on YouTube. 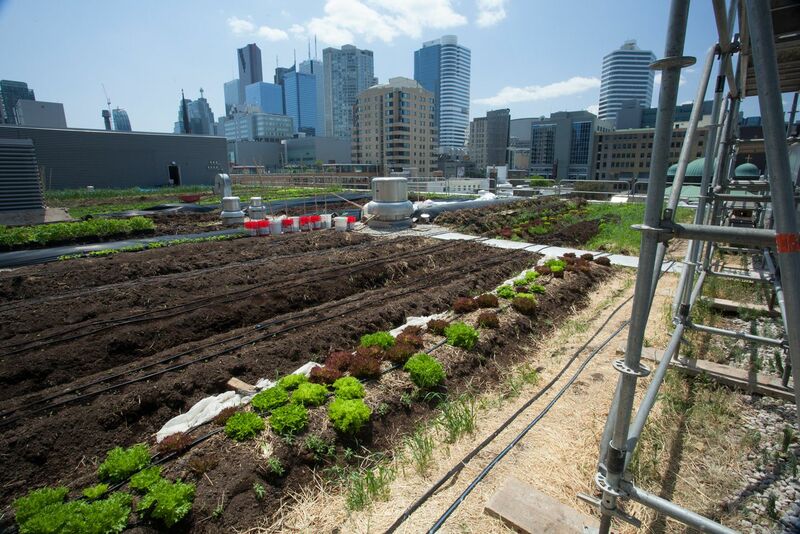 Greenroofs.com Project of the Week video photo credits: All courtesy of Ryerson Urban Farm. 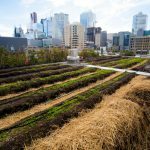 Read the May 6, 2016 A green-roof oasis by Will Sloan in RyersonToday; October 16, 2015 The growing never stops on rooftop farm by Will Sloan from Ryerson University; November 10, 2015 Ryerson HomeGrown: from roof to table by Emma Cosgrove in The Eyeopener; and the December 21, 2014 Toronto-style thin farming by Lauren Mandel in EAT UP. 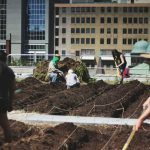 See many more articles on Ryerson Urban Farm’s In the News page. 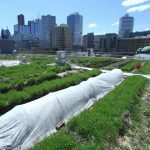 Ryerson University is home to a quarter acre rooftop farm on the Andrew and Valerie Pringle Environmental Green Roof, located on the George Vari Engineering Building in the heart of downtown Toronto. 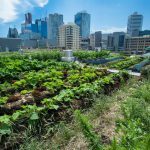 Originally built in 2004, this green roof was converted into an edible garden in 2013 by Ryerson’s student-initiated garden group, Ryerson Urban Farm (formerly Rye’s Homegrown). Since then, more than 1,000 people have visited the farm through tours, workshops and events. 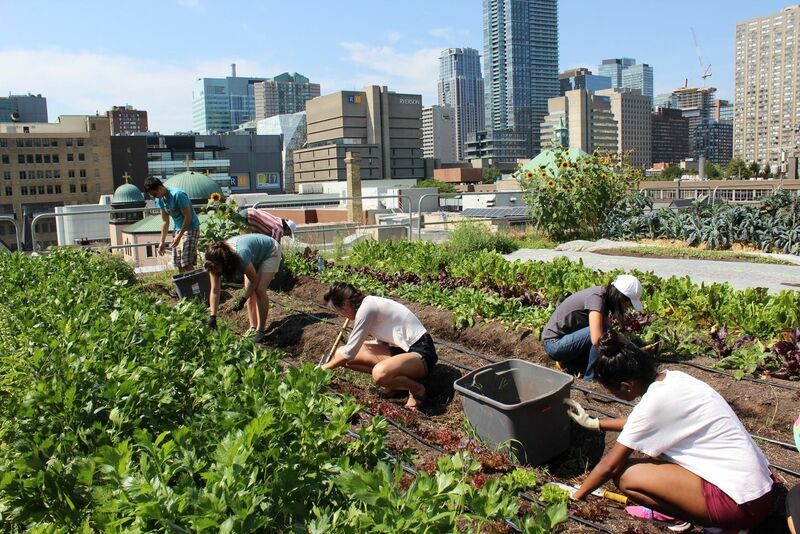 In 2015, the farm produced nearly 8,000 pounds of produce, distributed between Ryerson’s campus kitchens, the Gould Street Farmers’ Market and to volunteers through a weekly food basket. 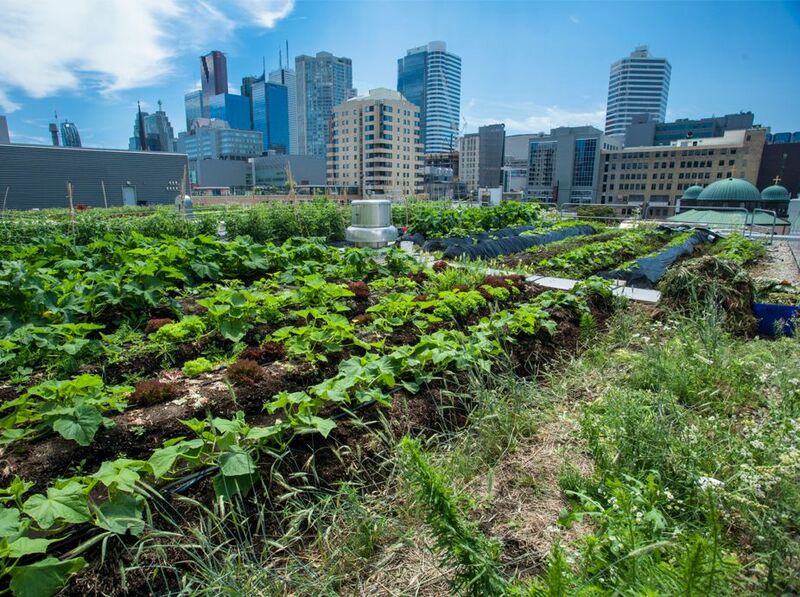 Set in one of Canada’s most densely populated neighbourhoods, this innovative project demonstrates the potential for the urban landscape to be used to produce food as well as to contribute to the health and well being of both our community and our environment. 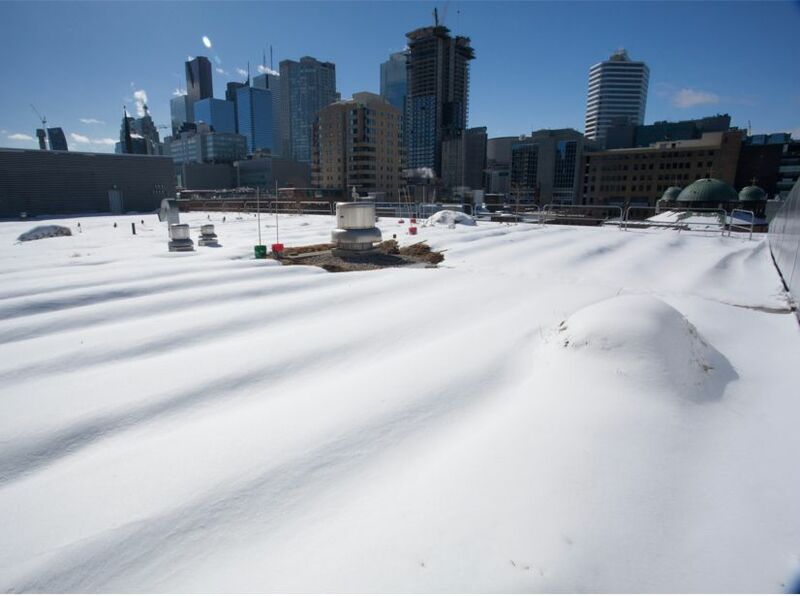 The green roof was built in 2004 by Terry McGlade of Gardens in the Sky (later Flynn Canada) as part of the original design/infrastructure of the building to catch storm water runoff, reduce the urban heat island effect and reduce energy consumption by cooling the building during the summer and insulating it during the winter. It was initially planted as an ornamental garden with daylilies, (Hemerocallis ‘Catherine woodbury’) and from the beginning was equipped with a suite of hydrological and climatological sensors for research purposes. 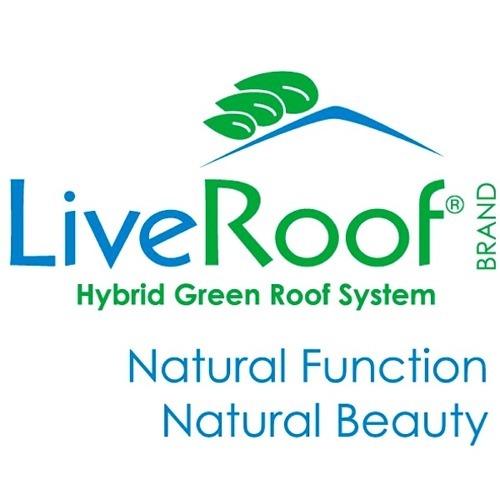 This roof received minimal maintenance for over eight years, with just woody species being removed to prevent membrane damage, and for many years there was no irrigation system installed. After just four years the number of species had risen to thirty-nine, as many volunteer species colonized. Until 2013, this urban ecosystem continued to evolve into more of a prairie meadow with Aster sp., Asclepias tuberosa, Linaria vulgaris and Vicia cracca prevalent amongst the grasses. 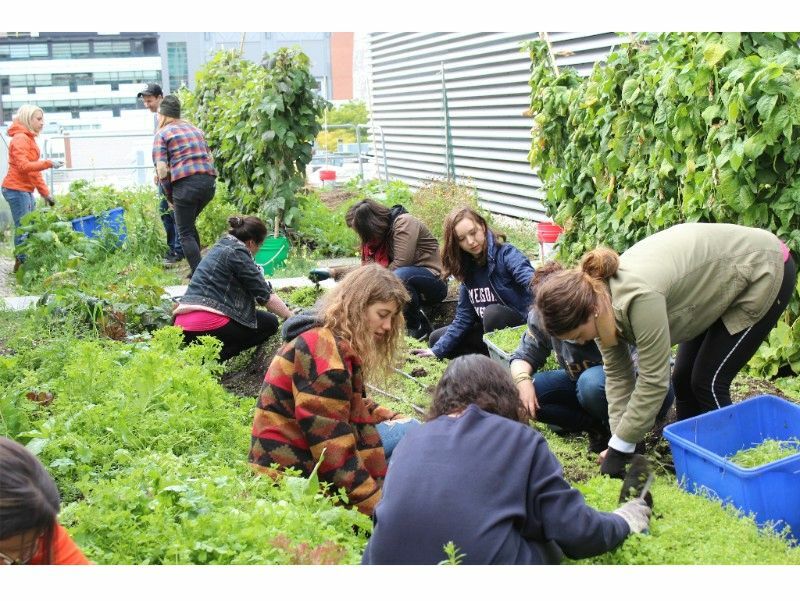 By 2014 weed seeds had blew in and were deposited by birds, so Ryerson’s Campus Facilities & Sustainability department needed a plan to revitalize and maintain the space. 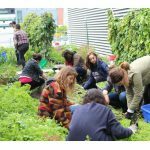 Since 2011, Campus Facilities & Sustainability had been working with Ryerson Urban Farm (RUF) to identify under-utilized spaces on campus for food production on the ground-level and it became apparent that this would be a natural fit, so they proposed that RUF take over the maintenance of the green roof. 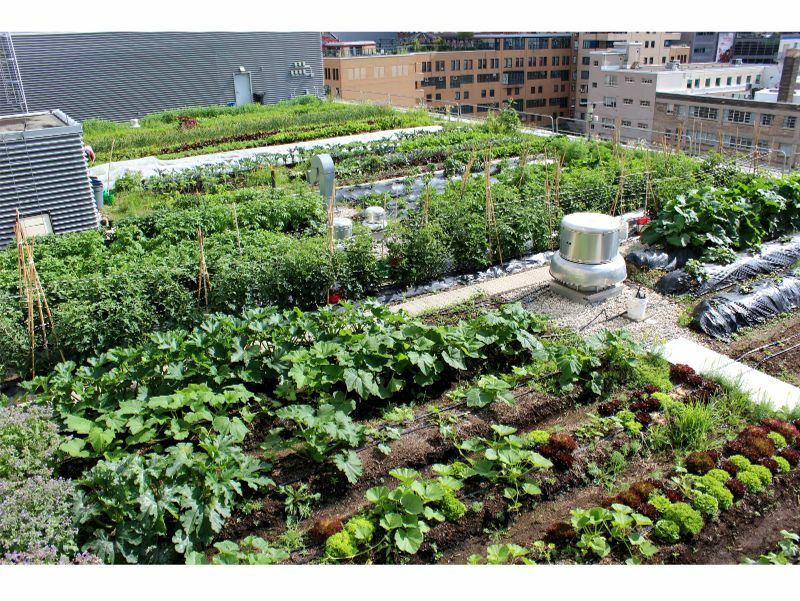 RUF started with a pilot project in 2013 in one section of the green roof to see if they could successfully grow food and could gain the trust of Campus Facilities & Sustainability as stewards of the space. 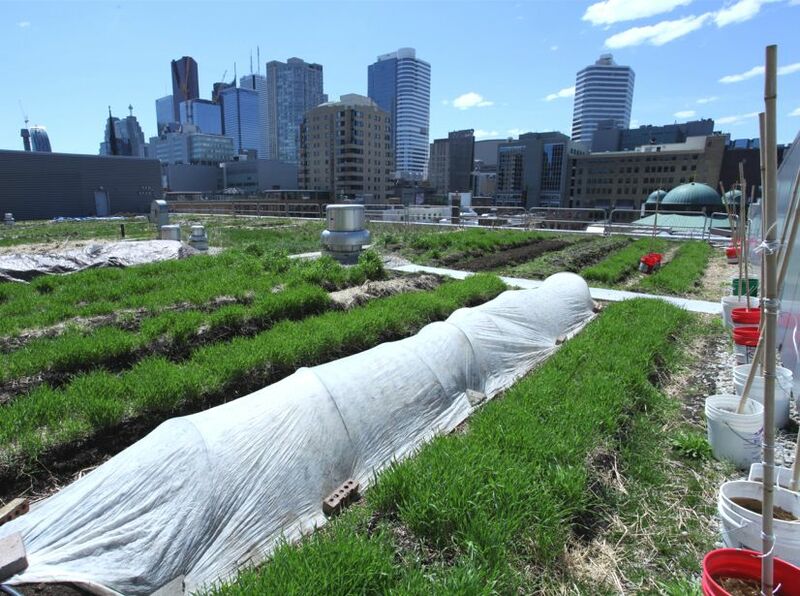 In order to incorporate sustainable agricultural practices and reduce costs associated with labour and other resources, the conversion of the green roof from ornamental to food production garden used the permaculture technique of sheet mulching. 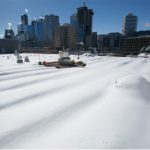 First, the weeds were allowed to grow in spring to knee height, then the foliage was cut to the ground and left in place covered with a tarp for three weeks. The advantage of this technique was that it created a biodynamic effect in the earth by stimulating the microbial life in the soil as the weeds decomposed. 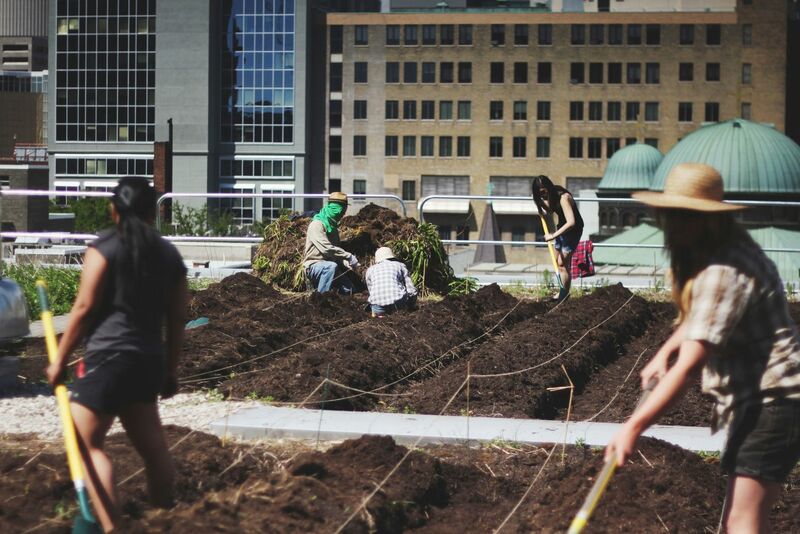 After the tarps were removed, RUF created raised beds by digging 18” paths and 30” beds to re-create what Jean-Martin Fortier describes as “human-scale” farming. This bed and path size has been proven to be an adequate width to farm without the use of tractors or other industrial agriculture tools. Once the beds were created, they added two inches of compost (standard annual practice for vegetable production) bringing the original soil depth from 6” to 12”. Drip irrigation was installed along with biodegradable mulch for weed suppression added to each bed, except for one to allow for direct seeding in dense spacing. RUF then planted a variety of vegetables that grew remarkably well, in fact better than at the ground level. 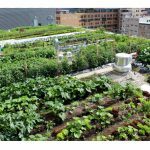 In 2014, due to the success of the pilot project RUF began the conversion of the entire green roof into a small-scale farm/market garden. The farm utilizes a five-year crop rotation based on plant families that include: Fabaceae and Asteraceae; Allium, Umbelliferae and Chenopodiaceae; Cucurbitaceae; Solanaceae; and Brassicaceae. The advantage to crop rotation is that soil borne pests and diseases that are shared among plant families are given five years to dissipate and it reduces depletion of nutrients within the soil. That year, RUF produced 5180 pounds of food with a revenue of $9971.00. In 2015, RUF completed the conversion of the 10,000 square foot rooftop, producing 7910 pounds with a revenue of $18,634.00. 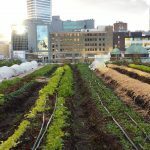 The food produced in the market garden is sold at Ryerson’s weekly Farmers Market in the spring, summer, and early fall. It is also supplied to food services to incorporate into campus dining and catering menus. Lastly, RUF utilizes Community Supported Agriculture (CSA) programs to distribute fresh grown vegetables. CSA is a financial model that is commonly used by small scale farmers whereby customers buy “shares” of the harvest at the beginning of the year and receive a basket of food for an agreed number of weeks. The advantage to this system is that farmers are able to earn income at a time of year when expenses are high yet revenues are typically low. It also alleviates the disproportionately high financial risk farmers take in relation to potential reward by sharing that risk with their “member” investors. The advantage for consumers is that, through building a relationship with the grower, they are more intimately connected with how and where their food is produced and are able to contribute to a healthier food system. CSA members pay $25/week for 20 weeks of vegetables at the beginning of the growing season. Additionally, RUF offers a working share through the Member Farmer CSA Program. Member Farmers contribute 3 hours a week to working on the farm in exchange for a discounted weekly basket of food. 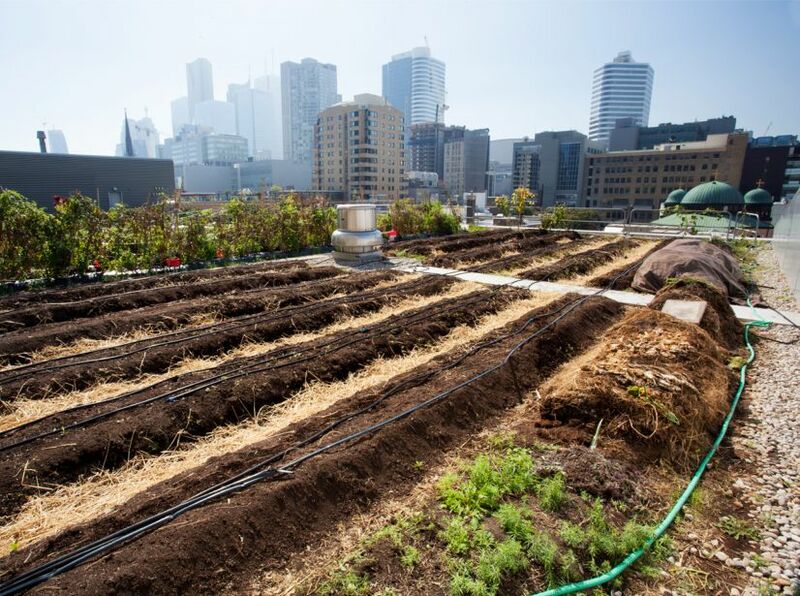 This allows members to learn firsthand about urban farming and engage in the growing of their own food. 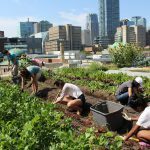 With the help of students, staff and faculty, Ryerson Urban Farm has created an urban farm with more than 30 crops and over 100 varieties. 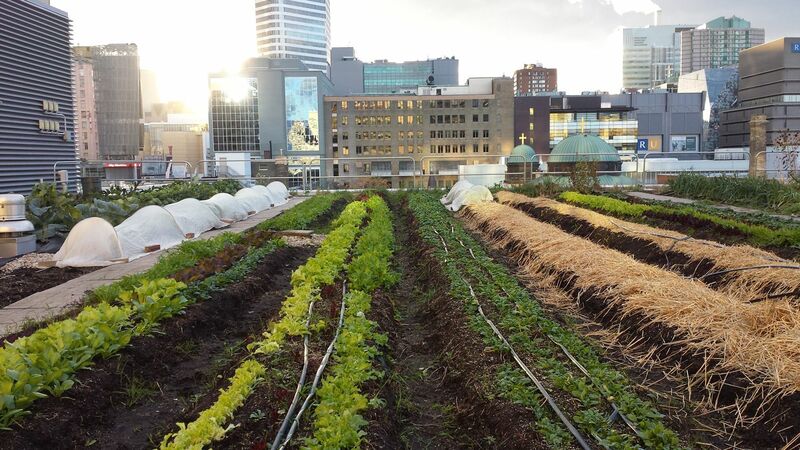 RUF aims to build capacity for urban agriculture through production, education and demonstration. They draw upon principles of ecological garden design to create gardens that are beautiful, productive and resilient. 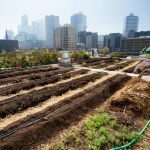 This involves incorporating local resources into the design, focusing on soil building strategies and using low-impact techniques. The results are gardens that are abundant, nourishing and lasting.